The San Bernardino Valley is a valley in Southern California. It lies at the south base of the Transverse Ranges. It is bordered on the north by the eastern San Gabriel Mountains and the San Bernardino Mountains; on the east by the San Jacinto Mountains; and on the south by the Temescal Mountains and Santa Ana Mountains; and on the west by the Pomona Valley. Elevation varies from 180 metres (590 ft) on valley floors near Chino, where it gradually increases to about 420 metres (1,380 ft) near San Bernardino and Redlands. The valley floor houses roughly over 80% of the over 4 million total human population in the Inland Empire region. The San Bernardino Valley was originally inhabited by Californian Native Americans, including people of the Serrano, Cahuilla, and Tongva tribes. The Spanish missionaries established the Politana rancheria in the valley in 1810, an estancia, or ranch outpost, of Mission San Gabriel Arcángel. It was built to graze cattle, and for Indian Reductions of the Serrano people and Cahuilla people into Mission Indians. After being destroyed in a revolt, the estancia was later reestablished as San Bernardino de Sena Estancia in 1830, and is now is a California Historical Landmark and museum in Redlands. From 1829, the Old Spanish Trail from New Mexico to Alta California was established and entered the valley from Monument Peak in the San Bernardino Mountains. In 1841 Governor Juan B. Alvarado of Alta California issued a Mexican land grant for Rancho San Bernardino, which included most of the San Bernardino Valley, to José del Carmen Lugo, José Maria Lugo, Vincente Lugo, and their cousin Jose Diego Sepulveda. Included were all of the original estencia buildings: the chapel, a tile kiln, a lime kiln, and a grist mill. By offering land, José Maria Lugo convinced a group of settlers from Abiquiu, New Mexico to settle on his rancho at Politania and defend against Indian raiders and outlaws preying on the herds of the Ranchos in Southern California. These emigrants first colonized Politana on the Rancho San Bernardino in 1842. Don Lorenzo Trujillo brought the first colony of settlers from New Mexico to settle on land provided by the Lugos about one half mile south of the Indian village of La Politana. Later they moved to found a new village known as "La Placita de los Trujillos", later called La Placita on the south side of the Santa Ana River. American settlers in the region included soldiers from the Mormon Battalion in 1847, after the California Campaign of the Mexican–American War was won by the U.S. In 1851, the Lugo family sold Rancho San Bernardino to a group of almost 500 members of the Church of Jesus Christ of Latter-day Saints (Mormons) led by Captain David Seely (later first Stake President), Captain Jefferson Hunt, and Captain Andrew Lytle, and also included Apostles Amasa M. Lyman and Charles C. Rich. The San Bernardino Valley was cut from fast moving water flows from mountain ranges in the north, east and south that collectively drain into the Santa Ana River basin that goes to the Pacific Ocean through Riverside and Orange County. The valley connects several open space natural areas and beautiful mountain and valley vistas. The San Bernardino Valley is surrounded by nature preserves, national forests, and recreational areas. Many people travel through the valley for a variety of outdoor mountain sports, including skiing, hiking, biking, and ballooning — in the mountain resorts of Crestline, Lake Arrowhead and Big Bear City. Once part of famed Colorado Desert and Coachella Valley. Joan Didion, in her essay "Some Dreamers of the Golden Dream," describes the San Bernardino Valley as "...in certain ways an alien place: not the coastal California of the subtropical twilights and the soft westerlies of the Pacific but a harsher California, haunted by the Mojave just beyond the mountains, devastated by the hot dry Santa Ana wind that comes down through the passes at 100 miles an hour and works on the nerves." 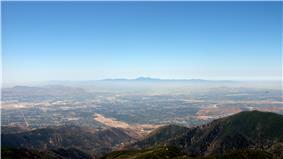 The San Bernardino Valley encompasses one of two drainage basins of the Santa Ana River, the Inland Santa Ana Basin. Underneath the surface area of this drainage basin, which takes excess rain water out of the valley, are several large ground water sub-basins, under lain by the impermeable granitic rock of the Perris Block, which capture water in aquifers underground. Designated ground water sub-basins include: Chino, Rialto-Colton, Riverside-Arlington, San Bernardino (Bunker Hill), Yucaipa and San Timoteo. The San Bernardino or Bunker Hill basin is bounded on the northeast by the San Bernardino Mountains, northwest by the San Gabriel Mountains, southwest by the San Timoteo badlands, and southeast by the Crafton Hills. Also, the San Andreas Fault and San Jacinto Fault zones enter the valley along the San Bernardino Mountains and San Jacinto Mountains, respectively. The two fault lines converge to less than 10 km apart in the city of San Bernardino, and less than 3 km in the northwestern part of the basin near the Cajon Pass. 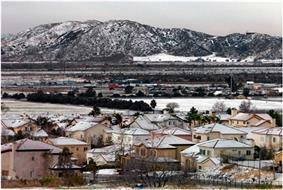 Occasional January snowfall in the eastern San Bernardino Valley, Shandin Hills are visible in the background. The climate is Mediterranean with cool to cold, wet, in some cases snowy winters (extreme east and north valley areas) and dry, hot summers. Usually the areas north of interstate 210 and east of interstate 215 see colder weather in the winter with occasional snowfall. Sage scrub and the Yucca plant are the predominant natural vegetation along washes and uplands; it intergrades with chaparral at elevations of 600 to 700 m. Other vegetation consists of a patchwork of grasslands, riparian woodlands, and mixed hardwood forests, which border the valley in the mountains on the north and east. The Santa Ana winds blow into the valley from the Cajon Pass, which exits the valley's north end between the San Gabriel and San Bernardino mountains. The seasonal Santa Ana winds are felt particularly strongly in the San Bernardino area as warm and dry air is channeled through nearby Cajon Pass at times during the autumn months. This phenomenon markedly increases the wildfire danger in the foothill, canyon, and mountain communities that the cycle of cold wet winters and dry summers helps create. The Route 66 Rendezvous in downtown San Bernardino attracts about half a million people annually from all over the world to watch California's largest classical car show. Although not in the valley, the San Bernardino Mountains attract much tourism to the valley as people drive up to the local resorts, especially in the winter months. A famous ski resort in the area is Big Bear. Other famous mountain communities with large tourism include Lake Arrowhead, Big Bear Lake, and Crestline. National forests surrounding the high valley include the Cleveland National Forest and the San Bernardino National Forest. View of the stadium and playing field at San Manuel Stadium. The San Bernardino Valley is home to a number of different sports teams, including the California State University, San Bernardino Coyotes, who compete at the NCAA Division II level in a variety of sports. In 2007, the Coyotes' men's basketball team competed in the Division II Final Four in Springfield, Massachusetts. However, only San Bernardino Valley College plays football at the collegiate level. San Bernardino also hosts the BSR West Super Late Model Series at Orange Show Speedway. The series fields many drivers, including NASCAR Camping World Truck Series regular Ron Hornaday, who drove the #33 in a race on July 12, 2008. San Bernardino city hosts the Inland Empire 66ers of San Bernardino baseball club of the California League. The 66ers play at San Manuel Stadium in downtown San Bernardino. The Rancho Cucamonga Quakes is a minor league baseball team in Rancho Cucamonga. They are an "advanced-A" class team in the California League, and were affiliated with the Los Angeles Angels of Anaheim since 2001, but switched affiliations to the Los Angeles Dodgers in 2010. They were affiliated with the San Diego Padres during the late 1990s. The RC Quakes play at the Rancho Cucamonga Epicenter. San Bernardino is also the home of Al Houghton Stadium and the Western Regional Little League headquarters of Little League Inc. Each year in the first two weeks of August, San Bernardino hosts eleven western states in the West and Northwest regional tournaments. Auto Club Speedway, a racetrack located in the city of Fontana, plays host to two NASCAR Sprint Cup events a year and various smaller races. It was built on the former site of the Kaiser Steel mill. 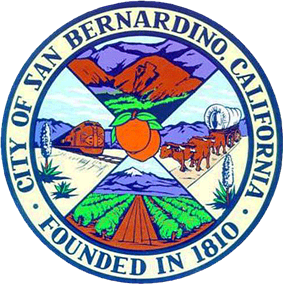 The Greater San Bernardino area is home to several cities. Some of which have their own school districts while others contract with neighboring cities to provide schooling. Notable ones would be the award winning Redlands Unified School District and largest school district in the area, the San Bernardino City Unified School District. 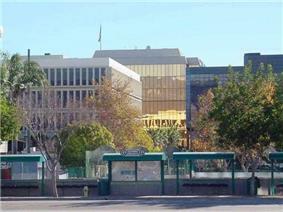 The Valley is also home to one campus of the California State University system as well as three community colleges. In addition, some private institutions are located in the Valley as well as various trade and technical schools. Although a significant number of the cities and towns are "bedroom communities" with residents commuting to nearby Los Angeles or Orange counties for work, the San Bernardino Valley is still an important transportation center to the state and country. Located approximately 70 miles to the east, the Ports of Los Angeles and Long Beach, a high percentage of goods destined for the rest of the country as well as items on their way out to the world pass through the valley, most of it on trains or trucks. Both Union Pacific and BNSF have tracks that run through the valley. 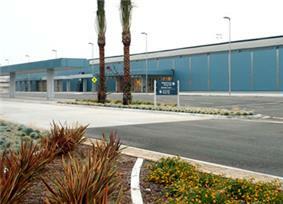 In addition, BNSF has an intermodal transfer facility in San Bernardino. The valley is also crossed by two major interstates and their auxiliaries. Additionally, the communities in the mountains north of the valley are served by several state highways. Mass transit trains and buses both serve the valley. Also, goods and people movement by air is available via two commercial international airports as well as several general aviation air fields. The Greater San Bernardino Area, along with the rest of the Inland Empire, is ranked by Forbes magazine as one of the American's unhealthiest commutes. The valley's first rapid transit line, a new brt system, has currently finished construction in the cities of San Bernardino and Loma Linda with an expected launch date of April 2014. The new line, dubbed San Bernardino Express (sbX), will offer rapid transit service which functions just like light-rail with center running stations, designated sbX lanes and passengers purchasing tickets prior to boarding. Stations will be approximately one mile apart with its northern terminus in Verdemont and southern terminus in Loma Linda's VA hospital, passing through downtown San Bernardino and the city's Hospitality Lane Business District. Although high percentage of valley residents drive their own cars, there are several available options for mass transit. The largest bus line in the Greater San Bernardino area is Omnitrans, which covers virtually the entire valley. The Omni lines also meet lines for Foothill Transit and Riverside Transit Agency buses, providing connectivity to Riverside County and Los Angeles County. The area is also served by Metrolink's San Bernardino Line and the IEOC Line. These lines lead to the Los Angeles Metropolitan and San Diego Metropolitan areas. The two main railroads in the valley are Union Pacific (UP) and BNSF. Both have extensive yards in the valley and it is an important area for national movement of goods. UP tracks enter the valley from the south alongside the BNSF tracks in Colton/Grand Terrace. They then continue north until the Colton Crossing, where they then turn east. Union Pacific also has a second set of tracks that were the Southern Pacific tracks until they took over SP. These tracks enter the valley from the west through Ontario, passing alongside the 10 until Loma Linda, where they turn and exit the valley to the southeast. The BNSF track enters the valley from the south by Colton/Grand Terrace as well, but continues north at the Colton Crossing. It then enters the intermodal and car transfer yards, where it turns east for approximately a mile. It then turns north again, running alongside I-215 until it meets the 15 in Devore and exits the valley via the Cajon Pass. Union Pacific also has a line that exits the valley through the pass. The Colton Crossing, located in Colton, is the point where the tracks of the two companies cross. The San Bernardino Valley is served by two major commercial airports, although it has many general aviation airports. ^ Hall, Clarence A. (2007-10-07). Introduction to the geology of southern California and its native plants. ^ Powell, Robert E.; R. J. Weldon; Jonathan C. Matti (1993). The San Andreas fault system. ^ a b Mian, Lal S. (December 2000). "Inland Empire Environmental Quality Paradigm" (PDF). ^ a b Davis, Liam H.; McKernan, Robert L.; Burns, James S. (1998). "History and Status of the California Gnatcatcher in San Bernardino County" (PDF). Western Birds (Organization of Western Field Ornithologists) 29 (4): 361–365. Retrieved 2007-12-17. ^ "Santa Ana Basin". National Water Quality Assessment Program. ^ "Figure 2-5 Bulletin 118, Groundwater Basins in the Upper Santa Ana Region" (PDF). Upper Santa Ana River Watershed Integrated Regional Water Management Plan. November 2007. p. 93. Retrieved 18 April 2010. ^ "Bunker Hill Basin Facts" (PDF). San Bernardino Valley Water Conservation District. Retrieved 18 April 2010. ^ "Watershed Info". Santa Ana Watershed Project Authority. Retrieved 18 April 2010. ^ "Weatherbase. ''San Bernardino Valley''". Weatherbase.com. Retrieved 2011-11-13. ^ 'Route 66 Rendezvous''"'". Route 66. Retrieved 2011-11-13. ^ "San Bernardino National Forest. ''San Bernardino National Forest''". Fs.fed.us. Retrieved 2011-11-13. ^ "Inland Empire 66ers. ''Inland Empire 66ers of San Bernardino''". Ie66ers.com. Retrieved 2011-11-13. ^ "Rancho Cuccamonga Quakes. ''RC Quakes''". Ranchocucamonga.quakes.milb.com. 2011-01-01. Retrieved 2011-11-13. ^ Van Dusen, Alison (2007-11-26). "America's Unhealthy Commutes". ^ About sbX. Estreet-sbx.com. Retrieved on 2013-08-17. ^ Omnitrans: Serving the San Bernardino ValleyOmnitrans.